TheMaker was started in 2005 and has always been Free Software in regards to license and price. And although we have put a lot of work into it we did not attract a great number of users although we have build a small but faithful community over the years. Then by the beginning of 2013 we released TheMaker to the MacApp Store which was a huge step forward for the project but mostly in regards of user feedback. I guess if people pay a little money they are more eager to provide feedback and report issues. So we have been able improve TheMaker a lot. With the release of Mavericks in the fall of 2013 we have faced unresolvable difficulties in meeting Apples requirements for Sandboxing which forced us the leave the App Store. We never made a lot of money while being on the App Store, but it gave us a lot of exposure. Right now this is just not the same. So we decided to make the application Free of charge again because it is more important for us to make TheMaker available to as many people as possible. We never made it for the money in the first place. 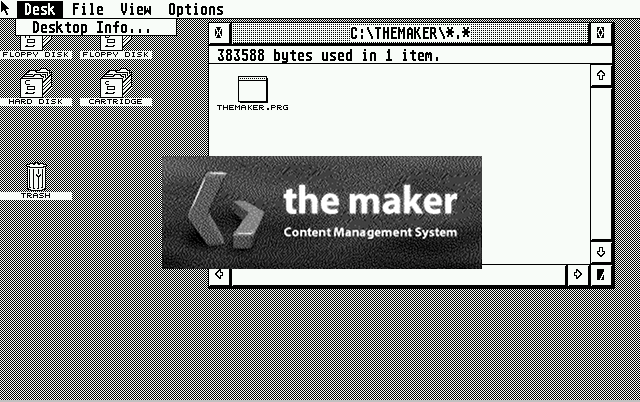 We are happy to announce, that version 1.82 of TheMaker has just been released. This is a bug fix release with some minor updates. It mainly fixes some issues we had on OS X 10.7. Lion. Ian and Gerald have been guests on Floss Weekly. The show that covers Free, Libre and Open Source Software. Thanks to Randal Schwartz and Dan Lynch for having us on their show. Is has been a great priveledge and a lot of fun. Finally after many long weeks and a lot of sleepless nights TheMaker 1.8 is here and it is just amazing. All we wanted to do was a small update of some things that were outdated but it all just turned into this massive update. New template dialog for creating new projects. Many UI and UX improvements. New right click contextual menu to file viewer. New and improved project handling, now you can store projects anywhere. Editor is keeping indentation level. For the longest time www.htmldog.com has been our preferred site for HTML and CSS reference. The web designer's resource for everything HTML and CSS, the most common technologies used in making web pages. Now www.htmldog.com has relaunched and it's better than ever. Reason enough for us to update our resources page as well. If you are interested, you can download TheMaker for the Atari ST(E)/TT/Falcon from here. You might also need the Hatari Emulator. Just in case you don't want to climb up to the attic. Enjoy! About 10 years ago, I found myself in the following situation. I had just joined a certain non-profit organization that is serving young homeless people in Austin, TX and since I was the only staff member with programming experience, I was put in charge of creating and managing the organizations website. Read The Story of TheMaker to see how the search for a productive site management tool resulted in the creation of TheMaker Content Management System. It is with great pleasure for us to announce the availablity of The Maker from the Mac App Store, we hope you enjoy this release and future development of The Maker. March 14, 2009 - What we are up to.. Occasionally you have to take a step back and make sure you are moving in the right direction. We are quite happy with the current feature set in the maker. The latest 0.9 release provides a solid set of tools for web-development. However, the next release will have a lot of improvements. We greatly improved easy of use and speed. The biggest changes are "under the hood". About 70 % of the code has been re-written or re-structured. This is giving us a huge advantage as it will be possible to implement new features in less time. Overall the code is more maintainable which means that bugs will be fixed sooner. We expect version 1.0 of the Maker to be released around the end of this summer. Feature complete and production ready. So watch this space... not much may appear to be happening on the surface, but believe us, it's full steam ahead. We wish you all a Merry Christmas and a Happy New Year. Enjoy the holidays. - Upload Queue ! change as many files as you like and then upload them at once. No "make all" needed anymore. The new and improved maker 0.7 will be released soon. We are in the last stages of development and are implementing the last features. * Upload Queue ! change as many files as you like and then upload them at once. No "make all" needed. * Changed code in source markers. Since the comment was above the Doctype declaration. With lot of major improvemnts 0.6.9 is getting us closer to 0.7 and thus closer to 1.0. A lot of hard work went into this release and we belive you will like it. The makerProject is pleased to announce that Ian Barrow has joined the development team. Ian has been an essential part of the development process since February '07 and since then has made countless suggestions for new features and improvements, many of them already visible in the 0.6.2 version. He has also done an amazing job in testing the maker as well as comiling the OS X Panther version. Welcome to the makerProject Ian ! March 19, 2007 - the maker 0.6.2 has been released ! Enjoy the new maker ! Please feel free to sent comments or bug reports. Ron Stephens was so kind to interview me for a second time about the maker. The python411 podcast is hosted by Ron Stephens and has been created to help people learn Python and learn about Python. Thanks to Ron for the Python 411 podcast. They are great and thank you for supporting the makerProject ! This is a BUGFIX release. Download and enjoy ! Please feel free to sent comments or bug reports. Threre are six new video tutorials available. They explain everything from project creation to the use of maker .dynamics. Have fun watching ! February 10, 2007 - the maker 0.6 has been released ! The 0.6 Version of the Maker will have major improvements. It will also include a lot of new features like CSS preview and such. One of the most important advantages is that it does not need a permanent internet connection like earlier versions. You will be able to create and maintain your projects on your computer and you will have fully working versions of them on your harddrive. We happy to announce that Brinick Simmons joined the maker Project as a developer. A new release 0.6 can be expected sooner. Also SVN is set up for all you would like to check out the current source. The maker 0.5.1 has been released. This is a bugfix release! This time there is also a binary version for OS X and Windows included. So you don't need to have Python installed. This will be a BUGFIX release and it will be available soon. It will also include a binary version for Mac OS X. I did not get any feedback since the maker has been released and there has been nobody who wanted to join the project as a developer. Feedback will decide about the future of this project. I bought a new iMac last Saturday and I really like it a lot. After getting all the tools together I installed the maker and a lot of unexpected bugs showed up. Now I am working on getting them fixed. If you find any bugs in the current version, please let me know. Junly, 28 2006 - the maker 0.5 has been released !!! The maker 0.5 has been released. I hope you have some fun testing it. This time there is also a binary version included. So you don't need to have Python installed. Today we are celebrating 101 downloads for the maker and this is really exciting. If you have downloaded the maker and tried it out, let us know you think. We would really appreciate your feedback and suggestions. the maker 0.5 - release date: August, 1 2006 ! Ron Stephens was so kind to interview me about the maker. Ron is the author of the python411 podcast. The python411 podcasts are created to help people learn Python and learn about Python. They are really great and very educational. After listening to every episode for at least one year it is my great pleasure that Ron took the time to make this interview. Thanks Ron ! I look forward to your future podcasts. This is the current roadmap for the maker. The maker has been released. I hope you have some fun testing it. Be shure to have the required packages installed. The maker goes into testing ! A beta release will be available soon !!! We are making our way towards Version 0.5 which will be an official (beta) release of the maker. You will be able to install and to run it and try it for yourself. All the essentials will be covered and we really look forward to your feedback. There has been a lot of work going into the maker and it will be a nice Version to go public. Version 0.4.8 was already running on the Mac, although there have been some tricky things to learn. The leap from tkinter to wxpython has been done and we are making our way towards version 0.5. It will also run on the Mac. The latest development Version of the maker is 0.4.1 . Mainly marked by the transition from tkinter to wxPython. Also the essential Content Management Code is being separated from the GUI. This will be very useful because it will enable us to access major CMS functions from anywhere. Even from the commandline. 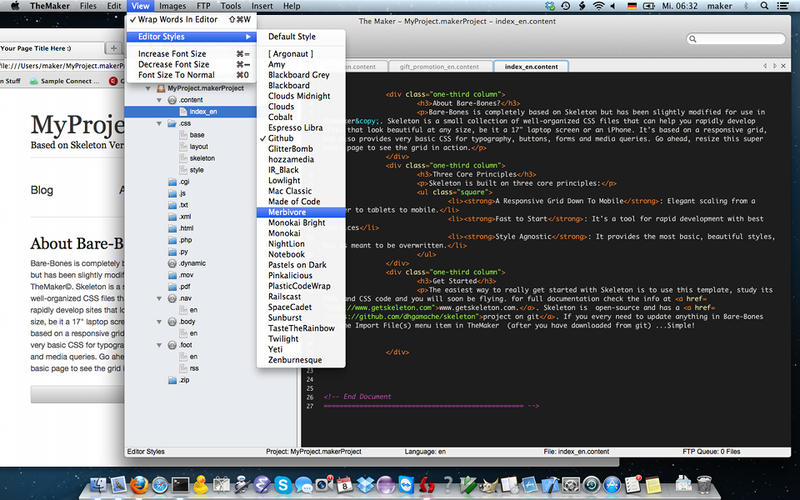 We also intent to do a Mac Version (as soon as I get one) using PyObjC with a Aqua GUI.